Last weekend, we had one of those lazy Sundays. I love it. My favorite thing to do to start off the day is cooking in my pajamas. So comfortable and so rewarding. 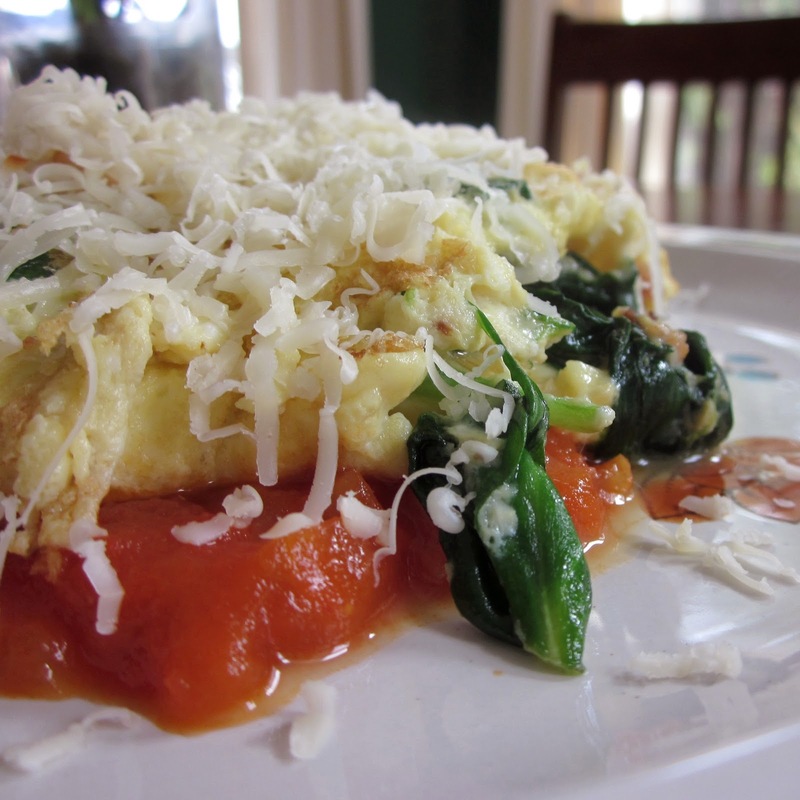 That morning, I looked through the fridge, grabbed some bacon, cheese, spinach, a few eggs and threw together a couple of hefty stacked omelets. I plated it with some tomato sauce left over from a lasagna the night before. whip up the eggs and milk with some salt and pepper, set aside. cut up the bacon in small pieces and cook them to a crisp on medium heat. discard most of the oil left in the pan, return it to the stove on medium heat. add to the pan half the eggs, and swirl the pan to spread the eggs, cook for a few minutes. use a spatula and carefully pull the edges of the cooked eggs into the center, add in half the bacon and spinach, cook until the spinach is slightly wilted. fold a third of the eggs over on one side, then proceed to fold a third of the other side over. 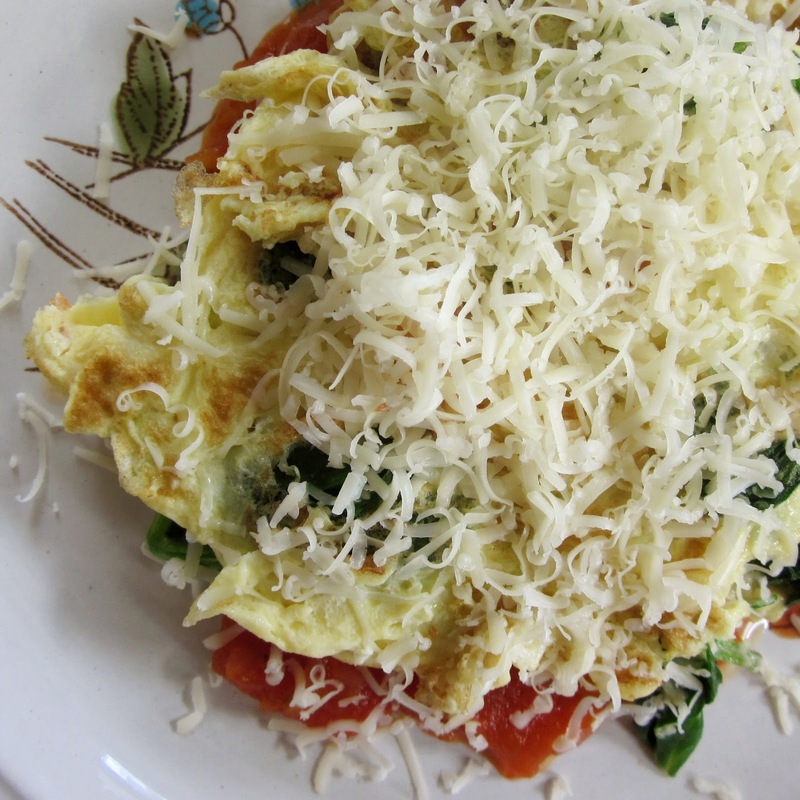 flip the omelet over and cook until the eggs are fully done. Heat the oil in a large heavy pot. Add the onions and garlic and cook gently for 4 to 5 minutes, or until translucent. Add the tomato paste and cook, stirring frequently, for 10 minutes (the tomato paste will separate from the oil and the oil will turn a vivid orange). Add the tomatoes and stir to combine. Simmer the sauce gently for 1 ½ to 2 hours, stirring and scraping the bottom of the pot every 10 minutes to prevent scorching.